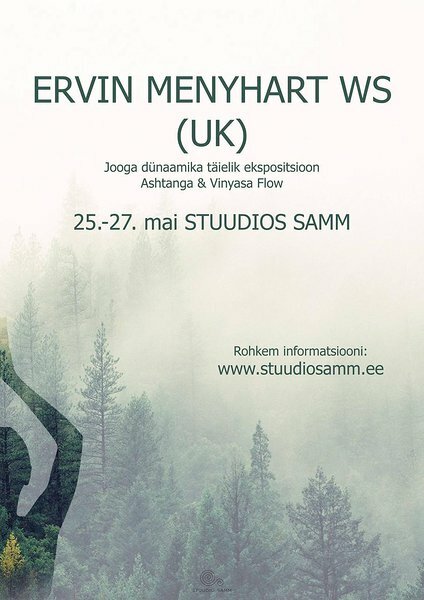 Mul on suur rõõm teatada, et Ervin Menyhart tulemas Eestisse ja ma kutsun Sindki sellest toredast nädalavahetusest osa saama. Ma usun, et see töötuba annab uusi teadmisi ja kinnitab vanu. Kindlasti arvetsame töötoas osalejate huve ning leiame aja nendega tegelemiseks! See nädalavehtus täis jooga töötubasid sobib kõigile, kellel on juba mingisugunegi kokkupuude dünaamiliste jooga vormidega, kes praktiseerib Ashtanga joogat või õpetajatele, kes sooviks saada kasulikke näpunäiteid ja inspiratsiooni enda tundidesse. Ervin on sündinud Ungaris, aga elanud aastakümneid juba Inglismaal. Ta on pühendanud viimased 30 aastat joogale ning selle jagamisele. Ta on saanud innustust mitmetelt väga suurtelt õpetajatelt ja aastaid ise uurinud jooga filosoofiat ning selle olemust. 25. mai 18.00 - 20.00 "Inner Monkey" lõbusad 2 tundi, kus saame enda meeltega töötada. Varajasele registreerujale soodushind 85 eurot kogu nädalavahetus, kehtib kuni 30. aprillini! Sinu osalus kinnitatakse, kui oled tasunud osalutasu täismahus 22. maiks Deepdance OÜ arvelduskontole: SEB EE091010220210798228 , selgitusse Ervini workshop ja enda nimi. Soovijatele väljastame tõendid töötoa mahu ja sisu kohta. In the physical practice first of all we must come to a good understanding of the two intertwined components - the dynamic part (vinyasa) and the held/static part (asana). Without an intelligent interface between the two no dynamic yoga form will work. The workshops will be suitable for all levels of practice, and highly recommended for experienced practitioners and teachers. We will explore the significance of working with the breath, selecting movement, alignment and posture holding alternatives in order to identify methods and techniques to suit individual needs and abilities. We will compare the ‘Mysore style’ ashtanga vinyasa with others such as vinyasa krama, and explore techniques used in styles taught by teachers such as BKS Iyengar, Norman Sjoman,to help each one of us identify the methods/techniques that suit us best. Often working in pairs and small groups, we will help each other to discover how some seemingly minor details can have great effects on the integrity and success of the postures and the connecting movement chains. To have a complete yoga practice, one needs to learn to use the posture practice as the doorway, a portal for deeper work, and look what lays beyond. There will be opportunities to learn basic pranayama (breath control) exercises, and we will explore meditative and self observing techniques to build better access to our ‘internal dimensions’. The set of workshops is structured in such a way that you can select individual parts / sessions to fit your interests and time availability, so while it is best to do the whole set, you can carve out what you want. There will be a cost advantage if you book the whole programme. Friday 25th May - Welcome to the Monkey House! If you think your ‘logical mind’ is in charge of your life, think again… Our ‘emotive/instinctive self’ plays a vastly underestimated role! We will explore our ‘inner powers’ through yoga based practices such as a flowing sequence of ‘mini-ashtanga’, Constructive Introspection (like Mindfulness Meditation) and ‘catching our Monkey and work’. A fun-filled two hours, including questions/answers/requests at the end. Using sequences from Ashtanga Vinyasa Yoga and other styles for comparison, we will explore how to set up correct foundations, positioning the pelvis, working the spine. 10.00-12.00 Building the Ashtanga Sequence and its Alternatives - exploring the postures and movement chains, correct use of asana and vinyasa; understanding, receiving and making necessary adjustments. 13.00-14.30 Full Flow Session: a complete, flowing talk-through session, with personalised modifications, where necessary. Consultation session with Ervin, to discuss the individual’s yoga practice, needs and aspirations. You can book this when you meet Ervin. Ervin was born in Hungary, also lived, studied and worked in Poland, Austria, Australia, settled in the UK in 1987 where he lives ever since. Yoga practice initially started in 1984, taken on as main occupation in December 2000. Ervin also taught yoga at Coventry University for ten years. His first teacher and mentor was James Critchlow, studied also with David Swenson, Richard Freeman, John Scott. Spent time in India learning at the old Mysore shala from K Pattabhi Jois, also practiced with Sri Sheshadri.